Belle & Sebastian’s recorded output from 1996 to 1998 is legendary, and rightfully so. In 1996, the shy Scottish indie-pop band released not one but two albums—Tigermilk and If You’re Feeling Sinister—that are either perfect or darn close. Two years later came The Boy With the Arab Strap, a third straight full-length packed wall-to-wall with gentle jangle-pop, whispered melodies, lovely melancholy and clever, character-driven lyrics. In between Sinister and Arab Strap, Belle & Sebastian did something unusual, putting out three four-song EPs—Dog on Wheels, Lazy Line Painter Jane and 3.. 6.. 9 Seconds of Light—in May, July and October of 1997, respectively. The tracks on these EPs were not gathered from the cutting-room floor; they were every bit as strong as those found on the aforementioned albums. Compile them into one 12-track set and you probably have Belle & Sebastian’s second-best album. Now, the band will follow a similar path with its first new music since early 2015. The plan: three five-song EPs, each named How To Solve Our Human Problems (Parts 1, 2 and 3), released in December, January and February. Added up, the EPs will equal a double album’s worth of music, according to the band, which will release a box set of the releases once they’re all out. 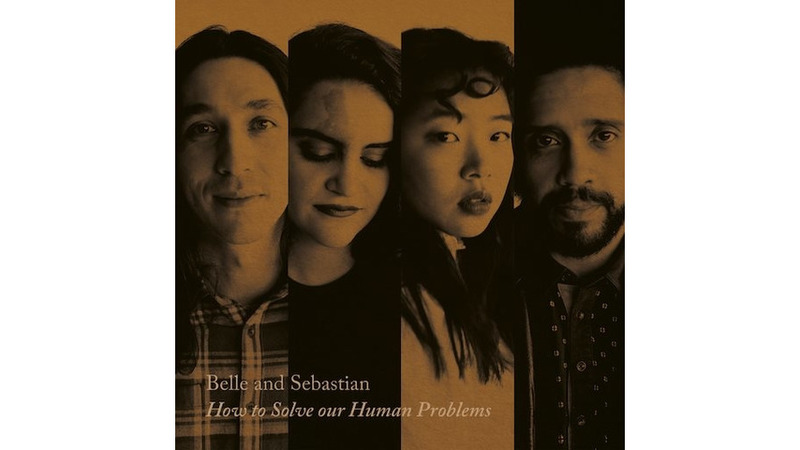 The songs on the first installment of How To Solve Our Human Problems work as a sort of audio tour of Belle & Sebastian’s stylistic wanderings has done over the past 20 years. With its skittering drum machine, overcast synth and singsong melody, “We Were Beautiful” sounds like an import from the Tigermilk era, at least until it kicks into a confident rock chorus. The juxtaposition is a bit jarring, but it works; the track is a highlight of the EP. Opener “Sweet Dew Lee,” on the other hand, recalls the airy, baroque pop that Belle & Sebastian explored in the early 2000s, on the releases after Arab Strap. “Fickle Season,” featuring the vocals of violinist Sarah Martin, echoes some of the band’s bygone lullabies, right down to the nostalgic sentiment and the woodwind solo. And closing number “Everything Is Now” is more or less an instrumental tune, with different instruments handling the melody, sandwiched by a choral reading of the title. It’s perfectly pleasant, but not much more than that. Still, by the end of the song, Murdoch urges, “You should dance till your heart is joyful.” If there’s Top 40 radio in space, “The Girl Doesn’t Get It” is a surefire mega-hit. And back here on Earth, Belle & Sebastian is back; maybe not to its ‘96-’98 form, but sounding more alive than they have in years.